Needless to say, I have ordered Bhoot Bungla! His Cubs these days are his grandchildren, but he says he still misses the excitement of the film world (I would too). He counted Helen and the brothers Kapoor (Shammi and Shashi) among his friends. His sister Marie Shinde was a very active dancer and choreographer at the same time. Marie was good friends with my pal Oscar Unger (Pompadour Man!) and taught a young up-and-coming actor named Amitabh Bachchan his first film dance! Before he gets tired of me pestering him, I am hoping that Mr. Lyons will share more memories and more films in which his band (and he) appeared. These are the films (and songs) that I know of so far, and every single one is truly a gem. 1. “Jaan Pehchaan Ho” in Gumnaam (1965). The one that started the whole obsession: a Laxmi Chhaya crowd-pleaser with “Mr. Charisma” Herman Benjamin manning the mike (the band has plenty of charisma too!). 2. “Tune Jo Samjha” from Boxer (1965). Mumtaz at her best in a fab fringy dress, surrounded by dancers dressed in fringe and backed up by the band dressed in fringe! A fabulous stripey extravaganza. 3. “Dekho Ab To” in Janwar (1965). 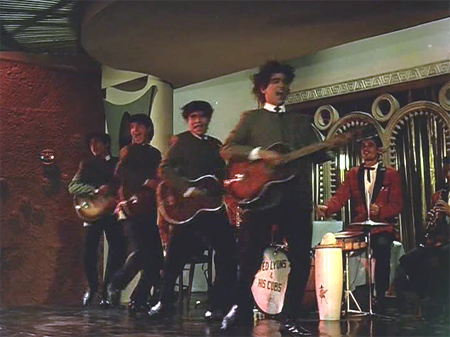 Everyone channels the Beatles with mop tops and Rajshree for company (and, being me, I have to add an extra screencap of Shammi). And that’s Oscar Unger playing guitar on the right! 4. 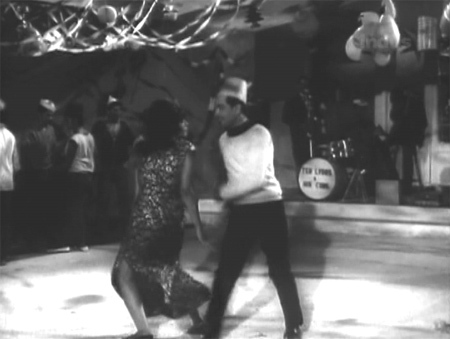 “Dance Music” in Mere Sanam (1965). 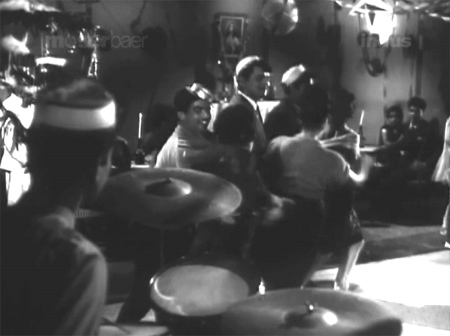 The band plays as Oscar puts the moves (and not only of the dance variety) on Asha P. while a fuming Biswajeet watches (it ends abruptly when Biswajeet punches Oscar). 5. “Nikolasa Nikolasa Mere Sang Jhoomle Zarasa” in Bedaag (1965). New discovery for me via Tom! and bonus is that Edwina is in there too, plus other familiar dancers and choreographers (Herman, Chinoo). 7. 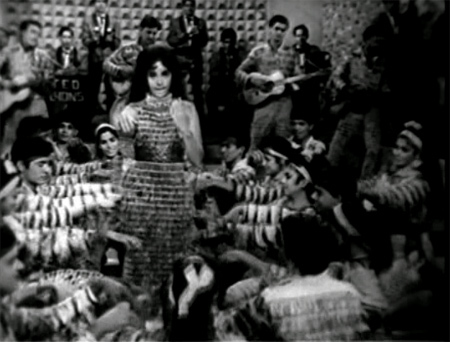 “Karib Aa Yeh Nazar” in Anita (1967). A drunken Sadhana croons this haunting tune in a bar. I love the three guys who get up and do a quick little loony dance move, and I’m thinking they might be band members as well. 8. 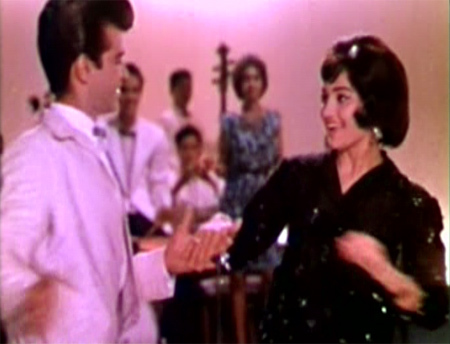 “Awara Aye Mere Dil” in Raat Aur Din (1967). One of my very favorite Laxmi Chhaya songs. And it gives us an idea of what Ted Lyons looked out upon over those years—people having fun and dancing like mad! I’m so happy to have discovered the joys of these songs. Ted Lyons & His Cubs have the same power over me that Shammi and Helen have: I will buy a film just to see them. They haven’t let me down yet! And if they play a song in Bhoot Bungla, they still won’t have (I pretty much like all the songs in Bhoot Bungla). Many pranams to you, Mr. Lyons. I can’t thank you enough for the entertainment you and your Cubs have given me. And I know I am not alone in that! Update: In the weeks since I wrote this I have discovered that the extent of Mr. Lyons’ talent and contribution can’t really be summed up easily. 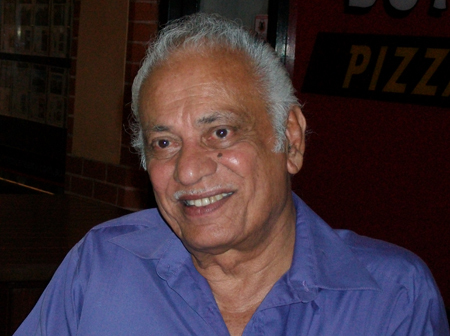 He was a background dancer and singer and bit-part actor, especially in Shammi and/or Helen movies (! No wonder I love him! : “Yamma Yamma” from China Town, “Suku Suku” from Junglee, and so many more); and has a number of extended family members who also made a very large albeit “unsung” (no pun intended) mark on Hindi cinema through the 50s and 60s. Terence himself also started up the first company to recruit all those gora extras that I am so fond of, looking bored and stoned out of their minds in all those nightclub scenes. I am having a lot of fun discovering this prolific and talented family’s work! As Terence and his family are spotted elsewhere I will add the information in the comments! Posted on January 25, 2010 at 3:34 pm in Hindi film history, Hindi movies, Memsaab's lists	| RSS feed You can skip to the end and leave a reply. Thats so exciting! What happened to Ted Lyons and his Cubs after the 60s? Were they onscreen after that too? And the band broke up with ted going off to Oz, is it? Didn’t the Cubs do anything on their own? Great to meet the man himself, memsaab!! Oh my gosh Greta! How wonderful to hear from them!!! Did they by chance ever put out any records (I am presuming that they were, in actuality, a real band). I am pretty thrilled :) I don’t know if they ever put out any records—what a great question! Terence said that they played weddings and charity events in between films, although naturally films were the most fun. (Yes, they were a real band)…If I can find more songs that they played I would love to put together a Ted Lyons & His Cubs film song CD for sure. Wow! More stunning research yields a musical gold mine! I would love Mr. Lyons to share his memories of how Western music and musicians collaborated with Hindi film musicians to create so much mid-century fabulousness. yea…a very energetic band….i love it too……. This is amazing bit of knowledge. All these songs were such fun. Your hard tapasya is paying off now. I wish I had married one of those Ted Lyon band members…. they look so cute. Look at Shammi’s shooooooooooeeeeeeessssssss. LOL! Shammi was really having fun with that one, you can tell! Rajshree had a knack for that kind of dancing too. Her birthday dance in Mohabbat Zindagi Hai is one of the best things about that film! Super find MeMsaab, a goldmine, alwayz wondered where Hermann-Oscar jodi and his beloved Band went, we have not seen anything on these wonderful PERFORMERS OF rock n roll, cha cha cha and twist. If yu liked what the Band represented then another song by Mannada called Aao twist karen is also peppy and well performed by Mehmood in Bhoot Bungla. And I suppose yu must have seen Shammi’s Kis ko Kis ko pyaar karoon kaise pyar karoon, same style as Jaan Pechhan ho…. and there are a quite a few movies with the Band where Shankar Jaikishan were the Music Directors. Cheers and once again g8 work on the bringing the boyz in limelight again. It is flower time the hippie ear music now…..
I’ve written up Cha Cha Cha although I had no idea what was going on (no subtitles)—but the music in that was terrific too. This is just great! Your site IS the defacto shrine for all that is hindi film history! Also, before emigrating to Australia, how did Ted end up in India? Was he born there? What’s that background story and how did he make it into the movies to begin with, I mean other than he had a band, more specifically what was the first connection? How is his Hindi? Please ask Ted these questions for me. Thanks. Great job, Memsaab. You’re putting together, slowly and surely, more film trivia history than ever been done before. How exciting to have actually spoken Mr. Terence Lyons. Too slowly, and my stupid job is getting in the way ;-) But I’ll keep plugging away. Yes, I was very excited—you can probably picture me jumping up and down like a crazy person! YAY! I’m really thrilled to read the news. I hope that Mr.Ted will share some of his memories with your eager readers. Thank you Memsaab for doing this site. Thanks to all of YOU who keep me going, honestly. He’s here? In Australia! Eeeee! I know! I’ve seen the songs, can’t believe I haven’t seen the movie yet. Soon soon soon!!! Will he not do an interview? He has fans! It’s really stupid but I’ve been pronouncing “Lyons” like the city in France. Until I saw the top pic in enlarged form right now. Now the world makes more sense. hehe Amrita.. I was doing the same until i read your comment!!!!!!!!! Did you pronounce that “fahncy”? Hahaaha! Ted Lyons and His Cubes – a cutting edge 1960s experiment in expressionism! I saw Bhoot Bangla during the winter holidays. Don’t remember Ted Lyons but I do like Jaan Pehchaan ho a whole lot. Sitaji asked about Ted Lyons–my guess is he could be what was called “Anglo-Indian”. Many of them immigrated to Australia in the 60’s and 70’s. Merle Oberon the Hollywood star might also have been an Anglo-Indian. Great and original post Memsaab. Congratulations. Gosh, it took me down the memory lane way back in the early sixties when as teenagers we used to pass our evening with a particular intent of finding new attractive girls in the neighbourhood and around or for having tea in a particular Irani restaurant and playing the songs of Cliff Richard and later the Beatles on a juke box. (Those were Come September days too). The Byculla and Mazagaon area of Bombay was especially thick with the anglo-indian population and I had lots of friends. In fact, I could easily mix up with them since I was very fair then and people used to mistake me for an Anglo-India especially since they used to see me wild during the Christmas and New Year celebrations. A word of caution, however: not all anglo indians were fair some were dark too, taking after one of the Indian parents. I don’t remember so many faces now and even those incidents I have never recalled, that is, uptil now. But I do remember one face distinctly. Probably her name was Pamela. 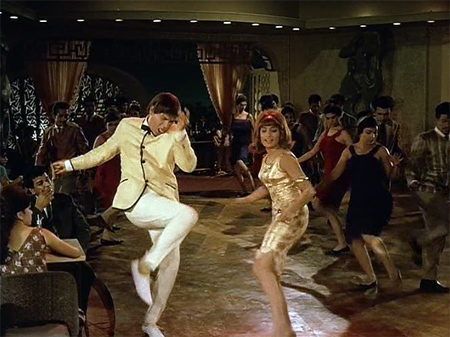 You can easily spot a tall young woman wearing a golden dress and loose hair, in Arzoo (1965) dancing twist to the music of the song JAB ISHQ KAHIN HO JAATA. In fact she appeared in many movies. Without amplying, I’d jsut say that it was at the Clare Road, Byculla that we made her acquaintance. 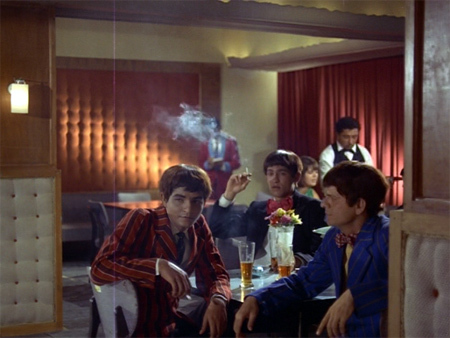 Anglo-Indians were frequently cast in a club or hotel dance sequences of the movies of the Fifties and the Sixties. I mention the location because any Anglo-Indian anywhere, who has migrated from Mumbai (Bombay) would remember that location. You could ask Terrance if he ever stayed at the Byculla or Mazagaon area. Hi Nasir :) The woman you refer to in Arzoo is actually Ted’s sister Edwina!—she danced in a lot of films, and had a few lines in Arzoo as well (see my post on it here, which includes a screencap of her). She has been in lots of films, and I know that Terence and his family lived in the Byculla area. Thanks for that particular info that it’s Edwina. I think that years have passed by so it should not upset anyone what happened in those youthful days. The fact of the matter is that there was one Irani boy who was older than us and particular mad about her. But she wasn’t interested in him. One fine evening during the Bhoot Bangla days we boys were moving round at Clare Road (a beautiful small road that had two beautiful convent schools) There was/is also a Shelter Home. So we happened to spot this beautiful woman buying something from the grocery. There is/was a famous building there known as Hitchcock. That was the location of the grocery. Now our Irani guy began calling herShe was in the shop and our group was on the foot-path or pavement. I still remember this particular scene: She just came out of the shop and confronted the boys. Was she tall! She even slapped the Irani boy. All of us were dumbfounded. I remember that she had some injury or bruise on the nose ridge because there was a piece of bandaid. That was the day when I stopped moving with the Irani guy. Yes, thereafter I saw that woman in many club scenes of our Hindi films. If you are friendly with Edwina, please ask her if she remembers that particular incident though I doubt it. Now I knew so many Anglo guys that I cannot pinpoint exactly who was who. Yes, there was one whom I used call Terry and he was my classmate at St. Mary’s. I’m mentioning this because who knows I might hit the bull’s eye! Ha ha! I will certainly ask Edu if she remembers that—she very well might, and I have no problem envisioning her doing all that :) She is an awesome lady. This is what I love the most about your blog – such amazing people, including those who were part of Indian film/music history, show up here! I think it’s incredibly generous of you to share all these people and information with us. As for Bhoot Bangla, I join everyone else in encouraging you to watch it – it’s a total trip. BB already has a special place in my heart because of RDB’s bit role in it and now to find out that it’s Ted Lyons in the scene before “jago sonewaalon”, that just tickles me happy. It’s what I love most about my blog too. Am very grateful to it (it feels at this point like its own entity)! And you are one of my chief suppliers of information and movies and obscurities! So *THANK YOU* Shalini. I had not given much importance to this topic mainly because I have no clue what is being discussed here. What I can gather is that Mr Terence figured in this movie “Bhoot Bangla” and now he lives in Australia, having emigrated there. It is nice of him to share some information with you. He posted the same comment in my blog too in the bhoot banglaa song under question (Jaago sone waalon”). From the description, it does appear that he is an Anglo Indian. Indeed, I too like to imagine that you are an Anglo Indian. Incidentally, one of the ex Miss worlds from India (there were several in 1990s and in 2000s ) was an Anglo Indian, viz Diana Hayden. Ha ha! Atul you are hopeless :) You concentrate on songs and lyrics and I will concentrate on who performs them onscreen! Must find Ted’s comment on your site now! I don’t want to push my luck :) or become a stalker! but we’ll see. Wow, If this goes on, I’m sure Laxmi Chayya will be soon mailing on your blog. Simply a super duper find. Give Ted Lyons our love! Well, maybe her relatives. She passed away in 2004 unfortunately :( But I’d love to hear from anyone who knew her! Noooo! That is really sad! Do you know any details about her? What she did after the movies? She looks like she just had a rough night out! That makeup is appalling…but then, the makeup in that entire film was appalling! Great discovery indeed Memsaab – bahut bahut shukriya. We fans based in Australia would love to know more about Ted Lyons. As many people have indicated in your comments column, a lot of anglo indians indeed migrated to Australia in the late 60s and early 70s (at that time Australia was allowing “white immigration” only! It was only from 1972 onwards that Whitlam, the then PM of Australia opened the doors to migrants from other Asian countries. Terence confirmed (he came and read the comments here) that his father was Irish (from Cork), married an Arab woman and they settled in Bombay and had nine children. 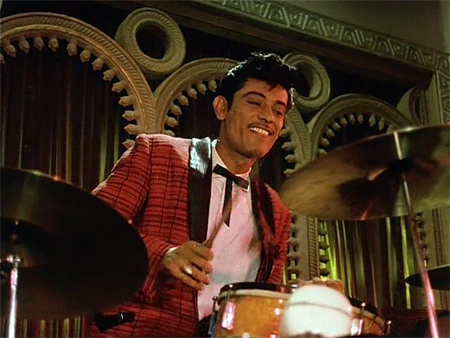 He spent 20 years in the Bombay film industry as a dancer and drummer/band leader. He also informs me that Ruffled Shirt Guy is not Vijay :( So the search for his identity continues! WOW – how exciting that you actually got in touch with the real person. I was watching Ganga Jamuna and noticed a familiar face among the dancers accompanying Dilip Kumar in the song “Nain ladgai hai”. On closer examination, turns out it was the face of Hermann Benjamin who had impressed me with his wild gyrations in the Jaan Pehchaan ho song from one of my favorite films Gumnaam. Just wanted to share this piece of info. And your great work excavating Nazir Kashmiri aka Ramu kaka in many films is commendable and really heart-warming in giving recognition to familiar faces whose names have been lost in time. Thanks for doing this! OOh! I now need to rush off and watch that song! I saw him in Solva Saal too, as an extra. I’m glad that my OCD is paying off for others too. I just wish these guys like Nazir could know how much a part of people’s lives they really are/were. He’s a fascinating man :) What a life! Any idea on who the guy on the far left end in the first screen cap is(playing the guitar)? I love that smile on his face. What an amazing smile! He does have a great smile. One of my favorite things about this band is how very happy they all are when playing. I suppose that’s true of most bands!!! but they have an extra “something” that I love. This is absolutely great information. Wouldn’t it be great if other stars and performers from Hindi movies of the 50s and 60s (or from times before that) touch base with you here- what a treat that would be! Not that it isn’t great anyway!! PS: Oh wasn’t it more fun in the 60s!!!! Well we can only wait and see, it is always a treat to hear from them for sure. Leaving this comment to say that I’ve updated the post with a screencap of Ted from the film Janwar—a nice closeup! WOW! I’ve been searching and searching for a Ted Lyons and his Cubs album forever. I hope you get to put together a compilation now that you may have some real help! Really nice of you memsaab for bringing back to us an era that has disappeared and oldies like me hang on too… Great work memsaab and hats of to Ted Lyons and his ilk. I may be wrong, but did Ted dance in Kai Din Se Dil Hai from Dulhan Ek Raat Ki? It looks like Ted in the beginning of the song. Later, it appears that he and his Cubs dance and do the twist! Still, I’m not sure. It does look kind of like him—I’ll ask!!!! I asked—and Terence confirmed that it is in fact him! Good eye, Mister Naidu! :)))) He says that he danced way more than he appeared with his band. He is in the background of many songs…I am just beginning to discover them all (Yamma Yamma in Chinatown, eg. )…his sisters too. What a family, and what a career. I love how graceful he is in this one, thanks for sharing! Nice song from Teen Deviyan. He was so easy to spot since he was the tallest in the room. And thanks for providing the time-stamping when he appears! Leading big names Bollywood choreographer’s from the 1961 have danced at Ramesh Dance Hall, Dadar Mumbai. And so has many film artist have visited Ramesh Dance Hall. Choreographers masters such as Herman, Robert, Raj, Satyanarain, Suresh, Kamal,Hiralal, Sohanlal, Willie n Soraj all have tapped there feet in this hall. Dance Hall business was run by Harishchander Rao Kadam, my father. He was the Bollywood leading craze actor in his days also was Producer n Director between the years start of 30’s to 1951, his last movie Dhram Patni. It was master Herman Benjamin who FIRST tapped his foot on the floors of Ramesh Dance Hall, giving birth to the hall followed by the rest of names in order as above. And it was here when I first saw and met Ted Lyons-1961. Today he lives very close to me in Brisbane Australia, coincidence. So here your dad must have been the Producer ? Their memories shall live on and certainly of Bhau Harishchander Rao Kadam, who really were totally devoted to what they did. This is so interesting – and touching ! Often people do not realise the amount of hard work put in by characters other than the main stars of the movie. What we see as a 5-minute dance or music sequence is the result of a lot of hard work and practice. Kudos to Ted Lyons – and kudos to you too, Greta, for bringing back to us people who time has otherwise forgotten. I have started spotting him everywhere now—Ted is very tall, so pretty easy to see now that I know what he looks like. 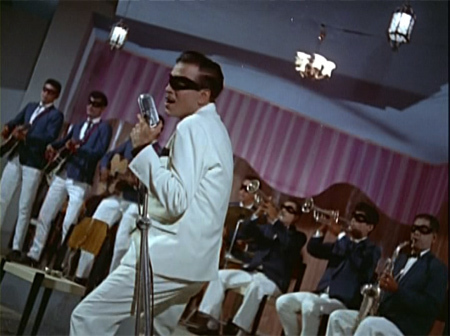 He is also in the very fabulous “Beautiful Baby On Broadway” song from Ek Phool Char Kante, first appearing at about 1:02–he walks across camera to the dance floor (big smile on his face) and then you can see him throughout the rest of the song dancing. No, it’s def. Shashikala :) They do look similar though! Looks like they are also the party band for Manoj Kumar in HIMALAY KI GODMEIN, rocking the house as usual. memsaab…recently discovered 2 new Ted Lyons videos. 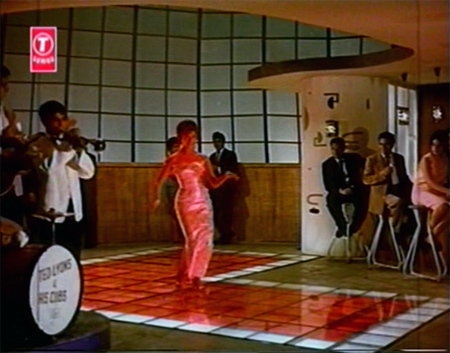 I’m featuring on my blog a fantastic number from Golden Eye Secret Agent (1967). That is a totally FAB number. I can’t get enough of it! Are sure it’s Ted and his Cubs though? I couldn’t see the name on the drum set or really get a good look at the drummer through all the frenetic camera work! It’s great to see him playing accordion on the Helen song though (I have the compilation and it’s great :)—he is just so COOL. I have a major crush on him! He plays guitar on this number from the same film as the Helen video (Gyarah Hazar Ladkiyan, 1962)—it is totally fabulous! MUST SEE THIS FILM…It is his sister Marie’s husband playing accordian as well in this. I had no idea he could play the accordion, too. He’s pretty good drummer, IMO, as we can all see in the Golden Eye video. 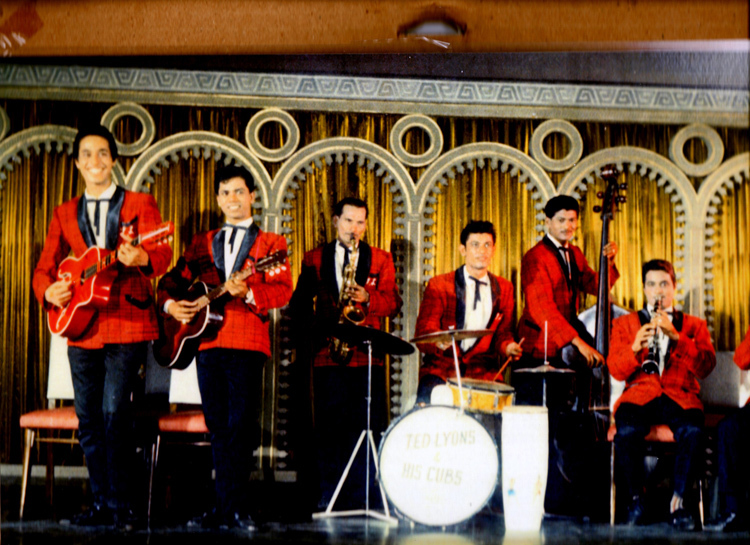 He says that he often lent out his instruments and outfits…but if he was playing with his band, they used the drum with “Ted Lyons & His Cubs” on it. I will ask him about it though :) He also said that although they were a real band, the actual songs that we hear in the film were recorded in a studio beforehand. But yes, there is a lot of verisimilitude since they are real musicians. Freeze the video at 1:58. I could have sworn that was him. Actually that’s the point where I thought that it wasn’t him :) He’s got a very distinctive smile and is taller and lankier. But it is his band, with his wife’s brother Suno on drums and Ted himself is one of the dancers in the crowd. Thanks Mister Naidu for this gem! 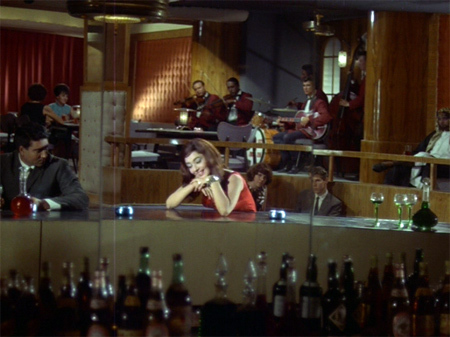 Ted is the tall man in the white suit at the bar in “Baithe Hain Kya” from Jewel Thief. At 2:06 you can see him from behind in close-up with Helen! Tom spotted Ted and his sister Edwina poolside in Johnny Walker’s song from Ek Phool Char Kaante, “Tirchhi Nazar Se” and Ted is also a dancer in 1957’s Aasha, in the fabulous song “Eena Meena Dika“! Ted sent me a link to this song, where he and his Cubs are playing (although they hadn’t given the band the official Ted Lyons & His Cubs moniker yet), and his daughter Patricia is one of the little girls dancing on the side. Here are Ted’s sisters in the best thing about Woh Kaun Thi, “Tiki Riki Tiki Riki”. Edwina is dancing with Oscar, and Marie is in a white flowery top at 3:06. Ted is also in the background at 2:10 in a gray suit and tie, the instruments all belong to him and his brother-in-law Sonu is playing guitar. I love this post!! God bless you, Greta & TL and all who love and make this craziness. I am so impressed by the way you pay attention to those little details in films. I wish I get to watch movies with you someday. I have benefited more from it than anybody :) I adore Terence and his family, and am so lucky to know them personally now. Oh yes I got the e-mail from Terry and you know what? I deleted it by mistake. Of course, I have tendered a thousand apologies. Fortunately, I found the second one have also replied to him giving him the relevant information. This business is really amazing! I never anticipated the pleasure of nostalgia as I have experienced here. So millions thanks to you memsaab! Oh good—I hope you can connect. It is a pretty small world these days, hai na? :) Cheers! Another sighting of Ted Lyons. This time without his cubs and band. I was watching the 1964 film Shehnai (starring Rajshree and Biswajeet) and there’s this (comic) scene where Johny Walker has been tricked into (by the girl) wearing extremely tight clothes (very modern, she said). JW does it with great aplomb, but the girl and her friends (Ted Lyons among them) had other plans. So Ted goes forward and does the twist by bending backwards and going down while dancing. Of course when JW tries there’s a ‘rip’. This is the csp. Yes of course, I did recognize Ted correctly, but took it for granted that the person who went on to the floor was him as it was after two quick closeups of Ted’s. Mister Naidu has found Ted & His Cubs in another rocking song from Tasveer (1966). A Wadia film that really needs to be put on DVD with subtitles, or at least vcd!!!! Feroz Khan and Rajendranath lead the way. Well lets see….Ted Lyons is my Uncle and my dad plays extras in some of the movies. So very proud to talk about my family being apart of the Bollywood movies. I would of loved to of been apart of all of this back in the day. Would love to be in a Bollywood Movie……how Amazing would that be? Hi Catrina :) Which member of this large family is your dad? You should be very proud of your heritage indeed :) And I can vouch for the fact that it is fun to hang out on the sets of a B’wood movie, although I’m not in the least tempted to be IN one (although if I had the musical talent and looks of your family I probably would be) :) Cheers. Sideburns!!!!! who doesn’t love sideburns! and racing! :) Great stuff! Here he is, in the catchy title song of Tum Haseen Main Jawan (1970). Just one shot but a good close-up one, on the drums, at 1:10. People have raved a lot about ‘Fusion Cuisine’ and how amazing it is to have foods and recipes from different countries and cultures fused together. Many do not know or are unaware that Anglo Indian food is the forerunner of and to ‘Fusion Cuisine’. With his music and band, Mr Lyons seems to me, to be the forerunner to the fusion of the big band with Bollywood before it was Bollywood. Bravo Ted and it also seems to me that you are as good a human being as you are a ‘Fusion Creator’. “Jaan Pahechan Ho” is now the background music for a Heineken Beer commercial “The Date”. It’s set in a wild restaurant/club scene in a CHINESE restaurant, of all things! The band is clearly Chinese, and it was funny to hear Hindi music from a Chinese band. I’m pretty sure it’s lipsynced over the original Gumnaam Rafi/Benjamin (& Ted and his Cubs!) version. Anyway, thought it might be a laugh. You can find the commercial on youtube. I’ve got to find my copy of Gumnaam and a working VHS player for tonight. . . Editing is not perfectly coordinated with the music but still good fun for our ‘Memsaab’ group :). I won’t be surprised if there is Chinese with Indian roots behind this commercial. There has always been a sizable Chinese presence in India (my favourite friends in school were Chinese). Sadly many have migrated. As I grew up I understood that they often got a raw deal here. Most of them were hard workers and I respect them for it. I just saw this commercial and immediately thought of you then came on here to tell you about it. Looks like other people thought the same thing. I am grateful to each and every one of you who has informed me about it :) Truly I am. Wow! Thanks for this international flavour! Just made me chuckle. It’s a really good commercial, as was “The Entrance” which was the precursor to “The Date.” As my years advance, I take comfort in trivia. Somehow I gain a sense of pride knowing that 99.9% of Heineken drinkers won’t ever make the connection. Anyhow, although I’m not about to start drinking Dutch beer, it did renew my passion for wicked dance moves and “Rockabolly”. Chinese or otherwise, the bands passion, camp, and the whole commercial paid fair homage to that special flavor of stuff now almost 5 decades old. Most may never know where it originated… but then there’s “us” who will keep the faith with perhaps a wry smirk and a loan of a few tapes or DVDs. Maybe I’m projecting, but I have to beleive Ted and/or Steve’s smirk is even bigger than mine. P.S. The biggest shame of the commercial was the ending, where the couple couldn’t dance with anything more than spastic siezure and flailing about . . .
That is why I posted the original on my facebook wall so that my non-Indian friends can see what they are missing. AWESOME!!!!! This looks like a film I NEED TO SEE. I love Sheikh Mukhtar. And Dara Randhawa! OH MUST SEE. :) thanks for posting these! Yep, it is Randhawa and Mallika, his wife and Mumtaz’s sister, I guess. Okay , the Anonymous who posted the Spy in Goa songs is bluelotus.Dont know why the post says “Anonymous”. I am feeling leftout!! You didn’t put your name in the field :) Still, thank you again! And for the Mumtaz song too! Thankyou sooo much for all this info. I too, like you, have fallen in live with Ted Lyons and his cubs. Iam a dj, and I was wondering of you knew of any recordings they might have? We’re any of there songs pressed to vinyl?????? No, as a band they played at events like weddings, parties…onscreen they are “pretending” and I think Ted told me that they never made any recordings. They should have covered Ted Lyons and all the background dancers that appear in every single one of those songs too! :) Glad you pointed out the error of their ways, ha ha. Ted is still alive and living in Australia; Herman passed away in 1969 from a heart attack. Ooh! One of my favorite Edwina songs is in that one: “Teri Nazaron Ka Ishaara Mil Gaya”…will grab it very happily. Faryal is in it too. Memsaab, you should write a book on TL& his Cubs!! You have got a knack for writing (that is very apparent!!duh!! ), you love 60s Indian Cinema (it was a magical era) but most importantly you have a very sharp eye to notice & research such details. Moreover, this band’s story is one that needs to be told…and who better than you. We all know about big stars of every era, but miss out on such largely uncredited talent, who made Hindi Cinema look so vibrant, kitschy & awesome. There isn’t even a Wiki page dedicated to Ted Lyons & his cubs. Please write a book on them…and maybe it becomes a movie one day!! They deserve it!! Hello! I live in Brisbane, Australia, & I occasionally run into Mr. Lyons riding on the bus, or in the Queen St. mall. We always chat, & I recently gave him the business card of “DVD King”, a DVD & merchandise shop which could maybe order in DVDs of some of his movies. If anyone can, they can. I knew he was a ‘Bollywood’ actor & band leader, but I never realised how BIG a star he really was, or how popular he was, & still is! I feel honoured to have met him! I will ask for his autograph when I next meet him! That was too much and do appreciate all that you have achieved during those memorial film takes with popular actors of the days gone by. Your families must be so proud of you. God bless and many thanks for sharing. It has been a real pleasure knowing you.